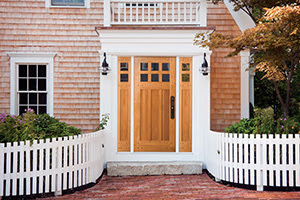 All Nantucket® Collection exterior doors now have a 10-year warranty with no overhang requirement, even for the toughest of exposures. Which means you can have the beauty of a wood door, at the design and size you need, with long-lasting performance. Simpson has engineered their Nantucket Collection with two-piece laminated components and a modified mortise-and-tenon joinery technique to provide long-lasting durability. 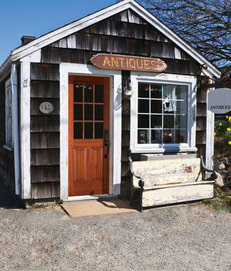 The Nantucket Collection is offered in either Douglas fir, Sapele Mahogany, or Nootka Cypress wood species, which are proven performers in an exterior exposure. Enjoy the beauty of a wood door, no matter how tough the exposure to elements. 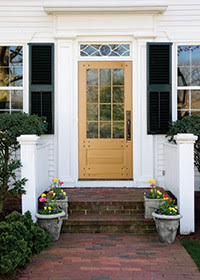 Select from dozens of door designs, like all-panel doors, French doors and sash designs. Create a dramatic design aesthetic with the Black Locust face-driven pins. Made with two-piece solid, laminated stiles and rails - no veneers. 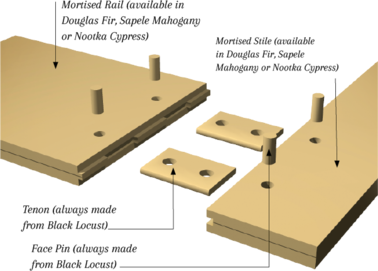 Modified mortise-and-tenon joinery with face-driven pins eliminate stile-and-rail separation. All divided-lite doors made with Simulated Divided Lite (SDL) construction. Design pressure ratings of DP50 (additional hardware may be required in some applications). Dozens of standard designs available in a wide variety of sizes, and all available either 1¾" or 2¼" thick. Two sticking profile options - Ovolo or Shaker - and two panel profile options - 1 7/16" Innerbond® double hip-raised panel or ¾" flat panel.